In all honesty, I really have to give my Yankees some credit. After an exceptionally long, lackluster offseason and kickoff to the season that consisted of losing our closer, losing our new starting pitcher, and well – losing in general, I was just about ready to accept the “fact” that my boys just weren’t going anywhere in 2012. Ready I was to rant about using rookies, vent against the long-contracted veterans, and strangle Joe Girardi. I find myself exceptionally busy for being on summer vacation, so I haven’t been able to actually watch games as religiously as I have in previous seasons. In the games I saw, the team looked lifeless, dead, beaten before they even stepped on to the field. But that was then. I don’t know when things changed, how they changed – or even if anything really changed at all. What’s different now? It’s the same old guys, but now these old guys that I thought were getting too old and too stinky seem to have new life. I look at the Yankee record, 34-25, just ½ out of first place, and I wonder: WHEN THE HECK DID THIS HAPPEN? Surely, I feel like an idiot. Okay, maybe I wrote my boys off a little too early. But it’s only June 10, and I don’t want to get too cocky, either. 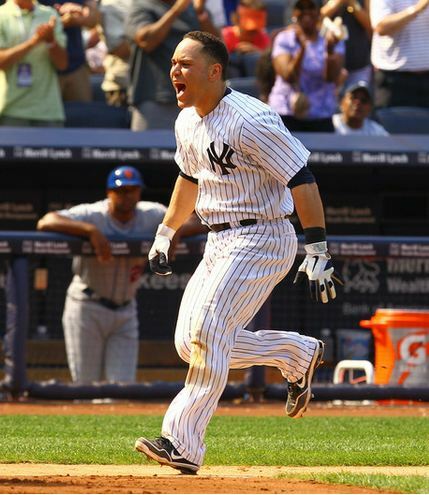 Then again, I actually watched this Subway Series in its entirety, and the Yankees looked fantastic in all aspects. The power bats surged, the starters dominated in lengthy fashion, and perhaps most importantly, the team had that all-important fire that has been missing. The whole team has exceeded my expectations recently, but three guys especially I think deserve some special recognition and apologies. Ever since the second half of 2010, I have been relentlessly ripping on Phil Hughes. I was mad at him for being fat and worthless in 2011. I thought he was done, and I was mad because I have his rookie card and would like it to be worth something someday. Constantly, I ridicule my Yankees for getting rid of their prospects, but I felt that Phil Hughes was one guy that they held on to for far too long. Finally, I think I’m seeing the real Phil Hughes. A 6-5 record with a 4.76 ERA may not seem too wonderful on the surface, but let’s remember, Hughes, like the vast majority of the Yankees team, didn’t exactly burst out of the gates when the season started. He sort of scuffled along, to put it nicely, racking up a frightening 7.88 ERA in his first month. Just when I thought all faith was lost, he started to improve. Take away that one bad start against the Angels, and Hughes has been fantastic from May onwards. He has lowered his ERA in 8 of his last 9 starts, proving that he definitely has something left to offer. He bounced back from his worst start of the year in LA – 7 runs on 11 hits in 5.1 innings – with arguably the best start of his career in his next time out against the Tigers – a complete game, where he surrendered just 1 run on 4 hits. So Phil, I’m definitely sorry for hating on you. I forgot you were only 25. You’ve really stepped up this season. While I previously thought our starting rotation was God awful this year, you’ve shined a light. Keep it up! When the Yankees were in Anaheim a few weeks ago, I wanted to kill Brian Cashman. It was the first time I saw the adorable, amazing rookie Mike Trout in action. God was he cute…and he seriously impressed everyone in my home. I wanted him, and I made it clear that I wanted him, prancing around my house saying, “Let’s trade for Mike Trout! Take him, and pay the Angels to take Teixeira!” Little did I know, he could have been a Yankee. 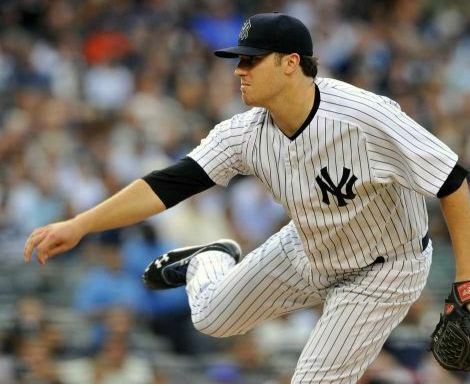 Supposedly, he was set to be the Yankee’s first draft pick in 2009, but they lost that draft pick to the Angels due to the signing of their free agent. 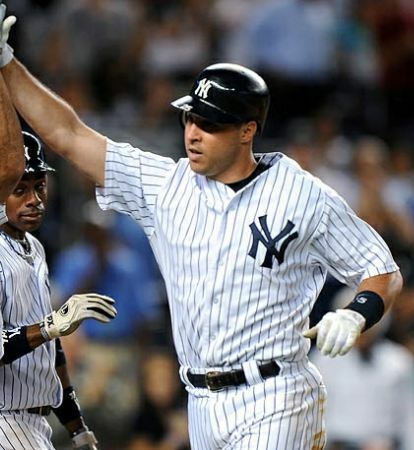 That free agent was Mark Teixeira. I was livid when I learned that. During the Angel’s series, I was probably at my height of my “I’m sick of Mark Teixeira sucking with a huge contract” phase. He just made me so mad, promising to bunt but never doing it, popping up or grounding right into the shift, and making that annoying face when trying to hit. He was the perfect example of what was annoying me about the Yankees: veterans with giant contracts that sucked but were still getting paid, doing the same thing over and over and expecting different results. Mark is a historically slow starter. At June 10th, maybe he’s just now getting his groove on. He’s actually hitting almost .250, which doesn’t seem like much, but he had been hovering around .220-.230 for so long that it was sickening. Teix has definitely shown glimpses of improvement at the plate, and still is arguably the best glove over at first. I’m looking forward to seeing how he performs going forward. The last guy I feel the need to apologize to is someone I’ve never come out and openly criticized. I have underestimated him, and perhaps neglected him. I don’t think I’ve shown Russell Martin nearly enough love, and today especially, he reminded me why I love him. I admit it, I’m not over the whole Jesus Montero thing, and I probably never will be. And all my blabbering about that little catching cutie probably made it seem like I had absolutely no faith whatsoever in Russell Martin. I never said it, but he worried me, spending practically the whole season under the Mendoza line. I mean seriously – Chris Stewart was hitting better. I know a catcher’s primary focus should be on assisting the pitchers, but when the Yankees were stinky, the pitching was too, along with Martin. So I didn’t feel like he was doing very well overall. When the calendar flipped to June, something sparked in Martin. All of a sudden he’s insanely good. Martin is hitting at a hot clip of .333 so far this month. And today, he was literally my hero, hitting 2 home runs (one to right field and one to left), WALKING OFF, and winning the Subway Series finale for my boys in style. Coincidence that Martin and the starting pitching have been hot simultaneously? I don’t know. All I know is that I don’t know what has changed with my Yankees, but I’m liking the results very much. Winning is fun. But more importantly, thinking you can win is even more rewarding. This series against the Mets opened my eyes, as everything seemed to work out for my boys. The Subway Series brought the best out of my Yankees, sparking my team and myself once again. I just hope we can carry this forward.